Bartholomew J. Simpson. 10-year-old who want to have it all and usually gets what he wants -- which is sometimes more than he bargained for. Has a huge repertoire of practical jokes and devious methods of revenge. Antics have included everything from kidnapping to international espionage. Says: "Aye carumba!" and " Don't have a cow, man!" First suspect in any situation. Sawed the head off of a statue of Springfield town founder Jebediah Springfield. Prank caller, vandalizer, skateboarder and blame-shifter. To be expelled from school forever. 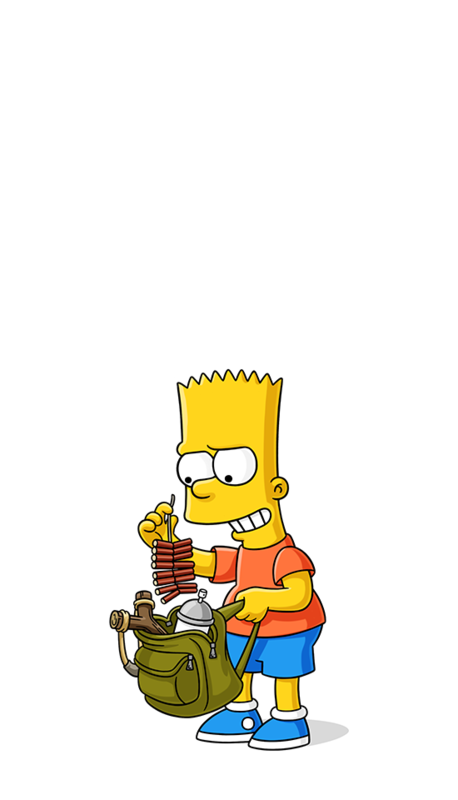 Bart visualizes his exam questions. Bart-man fights crime in the streets of Springfield. Bart turns Homer into a Jack in the box. Homer chases Bart after he confesses that he cheated on his test. Mrs. Krabappel responds to Bart's letter. Bart tricks his dad into thinking aliens are invading. Hi I'm Bart Simpson. Ay carumba, do the Bartman, etcetera, etcetera.